While I was in London about a month ago, I visited London's Buttercup Cake Shop (no affiliation with New York's Buttercup Bake Shop. I've been so busy I haven't had a chance to properly write it up, but I can tell you the cupcakes were DELICIOUS. Truly amazing and some of the best I've ever had, especially the banofee and sticky toffee ones (also the Elvis, with peanut butter frosting, was quite yummy). 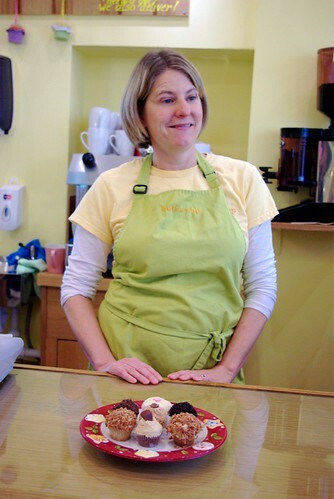 The shop was small and rather tucked away, and Donna gave us some mini cupcakes along with the larger sized ones, which I took to visit a friend in Hitchin, and she and her husband and 3-year-old son also adored the cupcakes. 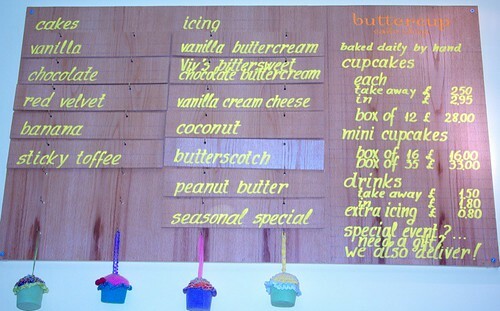 If you are in London and are looking for yummy cupcakes, I highly recommend Buttercup. These photos were taken during my visit. How long have you been baking, and where did you get the idea for an all-cupcake bakery? Why did you choose the all cupcake route vs. a more varied bakery? asking her "What else?" until we'd covered all the basics, we baked it up, and what I named "Joy Cake" was born. I covered it in blue icing and spelled out "Joy" with m&ms. Not the lightest or tastiest cake, but I was so proud of myself I just kept on baking after that. high quality and very broad range of flavours of cupcakes. Also, as Buttercup would not be the first "posh bakery" in London, I needed to be different, so specializing made sense all around. I love cupcakes and because the demographic trends supporting their popularity ring just as true in the UK as the US, I believe others will love them, too. What's special about Buttercup's cupcakes? 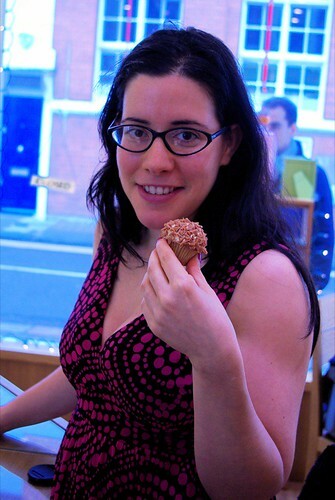 While we have a wider variety than other London bakeries offering cupcakes, customers tell us what makes the big difference to them is the taste and quality. We use American recipes which are designed to make a moist flavourful cake and creamy icing. I spent a lot of time alongside my baker trying the recipes with ingredients from various suppliers until we both felt we'd got it right. Then because my background is in Marketing, I did blind side-by-side comparisons with potential consumers (i.e. friends and colleagues) until they felt the cupcakes were just right. England has a tradition of fairy cakes. How are they different from cupcakes and is there anything specifically British about your cupcakes? Are they seen as a distinctly American treat that has invaded London? Cupcakes are different in a number of ways. Starting with the objective facts... a) fairy cakes are much smaller and traditionally have wings (cake cuttings cut into semi-circles and stood upright to resemble wings). b) fairy cakes use what we call icing - sugar and water or flavoring but no butter, cream, etc. Cupcakes can use icing but also buttercream frosting, seven-minute (egg) frosting, etc. 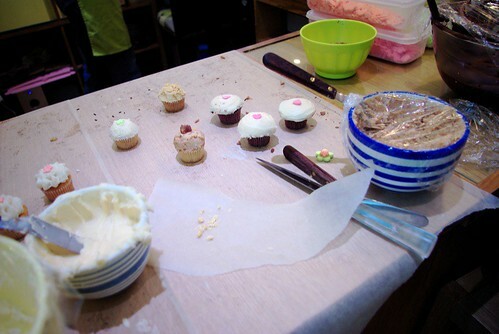 At Buttercup, we use buttercream-based recipes but have also topped cupcakes with meringue. c) Fairy cakes tend to be a bit dry and are best eaten with plenty of tea to wash them down. Our cupcakes are definitely American style rather than fairy cakes. However, with a couple flavors so far, we've "tipped our hat" to some of my favorite British desserts (or puddings, as they say here): sticky toffee and banoffee. Some British do see cupcakes as American and some see them as a derivation of their well-known fairy cakes. Someone recently gave a rebuttal to a radio show that talked about cupcakes invading the UK, and he said that like so many other famous "American" food items, cupcakes aren't really American in origin but just commercialized well there. He said that cupcakes came from England and got their name because they used to be baked in teacups. I tried your banoffee, based on the British pudding, which features banana cake, butterscotch frosting, and toffee shavings, and sticky toffee, and found them both to be quite incredibly delicious and unique. How did you go about creating this recipe and how do you come up with new flavors? I think about my favorite desserts/sweets and try to replicate them in cupcakes. Sticky toffee pudding is my all-time favorite British dessert. 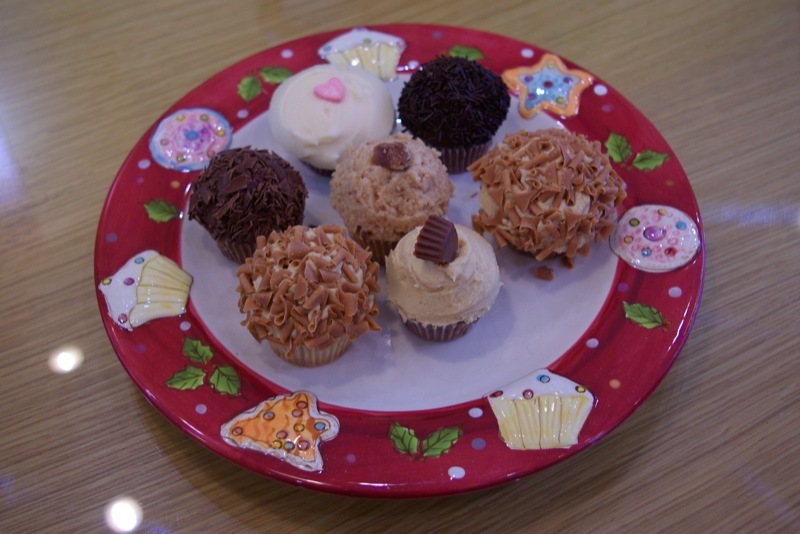 The chocolate peanut butter cupcakes are from one of my favorite candy bars. When I lived in Paris I discovered Berthillon ice cream on the Ile St. Louis, and they make a seasonal special in the winter of "marrons glaces" or candied chestnuts. So that was the inspiration for our vanilla chestnut cupcakes. I'm better at adapting recipes than starting from nothing, so that's usually what I do -- substitute ingredients then make adjustments until the taste and texture feel right. Sometimes I find my food memories aren't widely shared, like the persimmon cupcakes we made that reminded me of the persimmon bread my neighbor growing up used to make and share. Almost no one had heard of persimmons or "sharon fruit" as they're called here, much less tasted them before. Some of your special rotating flavors are banana split, cookies n cream, mocha and chocolate zucchini. Which flavor(s) are the most popular? So far the derivations of vanilla and chocolate are the most popular. And we hear about it if we run out of cookies 'n' cream by the time the kids get out of class! Funny enough, our French customers seem to have a more curious palate and seek out the original or exotic flavors. You're located on St. Albans Grove, which you call "hard to find, but worth the hunt!" Why did you decide to open your bakery there, and who are your main customers? Is most of your business from passersby or word of mouth, or do people come seek you out? children and parents from the primary school down the road, the university students from Richmond American University (just around the corner) and some nearby office buildings. 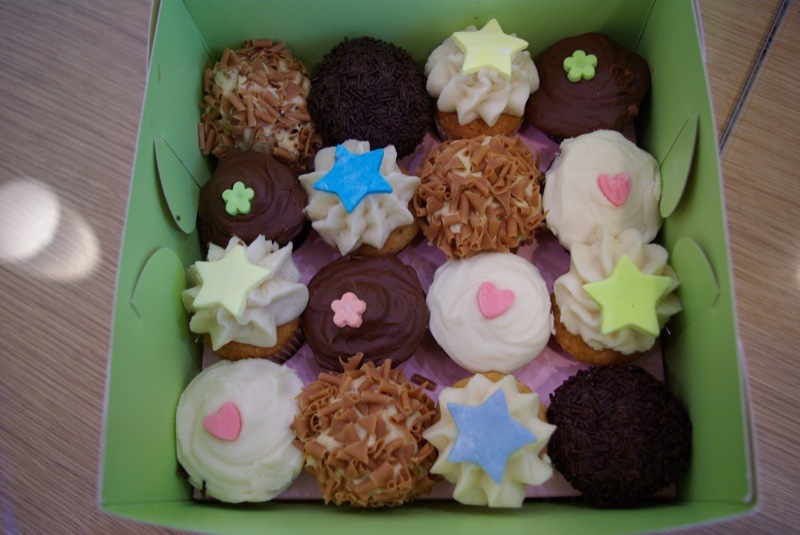 You offer takeaway boxes for mini cupcakes or regular size, with each cupcake held tightly in place. Are these boxes popular, or are most people buying one or two cupcakes? People love the boxes, and they especially make a big difference to our cupcakes that are being delivered across London because they ensure the presentation remains beautiful. But people are often buying for immediate consumption, so they're also happy to walk away with a cupcake on a napkin. What's been the most exciting event you've provided cupcakes for? What's the most and least exciting thing about running Buttercup? Most: hearing people's stories and making new cupcake fans. Least: the frustration and admin associated with a retail location – having to apply for a license for everything from music to chairs! Do you plan to introduce new and/or seasonal flavors? Why do you think there's been so much interest recently in cupcakes? Are they seen as a novelty or are they becoming more accepted as a dessert option? Underlying demographic trends support the growth and interest in cupcakes. a) We have increasingly on-the-go lifestyles, including our eating/snacking, so portability is important. b) Work and other stress means we look for small indulgences to reward ourselves. c) Household sizes are changing, with households of one person never before achieving such high levels. So we want individual portions, less wastage and more portion control. Cupcakes fill the gap. And because they can be as fancy as you'd like, they are perfect as an everyday dessert option and for special celebrations, too. It satisfies a sweet craving but unlike many other sweets, it is also filling so the satisfaction lasts. Sticky toffee - it has brown sugar, dates, butterscotch icing and caramel curls. Definitely our sweetest option! They are more of a celebration vs. cookies, brownies, etc. and they are more personal than regular cakes. Yes, improved portability without messing up the frosting! I make the innovations myself. But fortunately we have an artisan baker to entrust our recipes to once consumers have vetted them. He makes everything by hand and is willing to start work at 3 a.m., unlike me! What’s your first cupcake-related memory? I made my first friend in kindergarten, and her mom was a terrific baker. I fell in love with her mom's chocolate cupcakes with bittersweet chocolate frosting. That friend, Cindy, and I were roommates in college and baked this for each other's birthdays, and it's this frosting recipe -- Viv's bittersweet chocolate icing -- that we use now at Buttercup! Just that cupcakes are a happy business! I've concluded that people who come in for cupcakes are generally more fun-loving and happier than average, so it's an unexpected benefit of the business to be surrounded by them. Wish we could be in London to taste one of Donna's creations!Great interview! I was recently there myself and I can vouch for the cakes and the baker! Best cakes I've ever eaten. I can not explain the texture and taste, but if your in the neighborhood or have a party up-comming, you will not be disapointed. Ask for Donna. Buttercup have opened a branch in the new massive Westfield shopping centre in Shepherd's Bush. I was there last night and couldn't resist trying BOTH the Vanilla Purist and the Red Velvet cupcakes. A.MAYYYY.ZING. This was my first Buttercup experience... I am now dying for the Vanilla Purist cupcake recipe, or the closest possible alternative - can anyone help me out with a great vanilla cupcake recipe?